David Blaska, a well-known Wisconsin conservative blogger and alternate delegate from the Madison, WI area (Lord bless him) has sent a letter officially requesting WI GOP Chairman Brad Courtney to invoke Rule 9 of the Republican National Committee rules. The goal is to reconvene the 168 member Committee to replace Donald trump at the top of the GOP ticket this fall, either with an actual Republican like Evan McMullin or Marco Rubio, perhaps by moving Mike Pence to the top of the ticket and selecting a new VP. 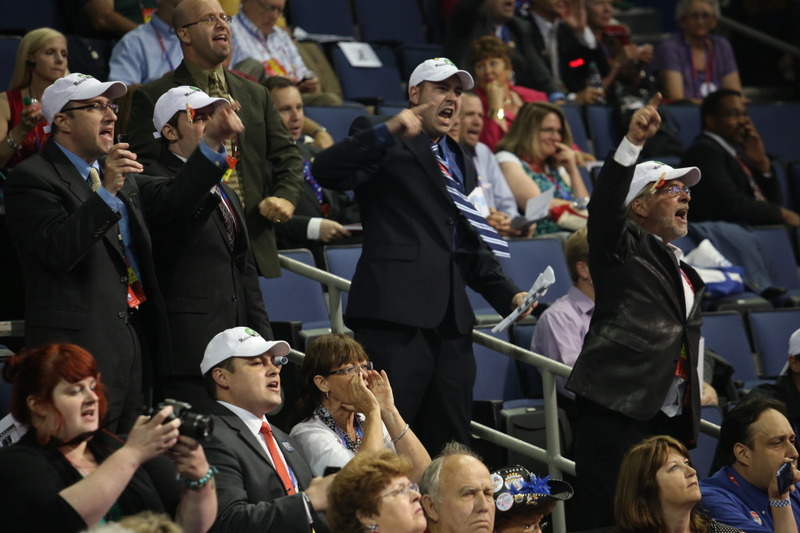 I was an alternate delegate to the RNC in Cleveland this July. It was a wonderful experience, but my conscience is bothering me. During the primary season, I supported Scott Walker, then Marco Rubio, then Ted Cruz. At the convention, I gave a quote to the (Madison WI) Wisconsin State Journal that I could vote for Mike Pence. Hell, at this point, I could go all in for Jim Gilmore. I am not a sore loser. I am only sorry that I did not speak up at that first Monday’s breakfast caucus at the Hilton to urge that we avert this looming disaster. I know I would have spoken for many delegates. I changed political parties in 1980 to become a Reagan Republican. I worked for Tommy Thompson and am proud to call him my mentor. Today, I am a Scott Walker/Paul Ryan Republican. Donald Trump may well be right that Republicans need to reverse course on international trade, nation-building and other issues. He may be right on issues but he is wrong on character. Donald Trump is a pathological narcissist, an embarrassment to our grand old party. Unstable, demeaning, petty, and downright dangerous. How did we manage to choose the one person who cannot beat Hillary Clinton, the weakest candidate in a generation?! Donald Trump is a terrible candidate. Just one example: Instead of allowing the Gold Star Khans their 15 minutes of fame he keeps the story alive through multiple news cycles. And now an obvious call for the Second Amendment solution if Hillary does win the presidency. (And I am an NRA member.) He would make a worse president. No poll shows that he can beat Hillary Clinton. Here in Wisconsin, Trump is down 15 points according to the Marquette Law School poll. Good and decent party leaders like Michael Grebe, Reid Ribble, and Scott McCallum want no part of Donald Trump — and their numbers are growing, thanks to the efforts of the Great Disuniter. Let’s unify our party! Under Rule 9(a), the Republican National Committee may fill “vacancies which may occur by reason of death, declination, or otherwise” of the Presidential nominee. “Otherwise” includes disqualification and removal. Please call this meeting to replace Donald Trump as the party’s nominee prior to the printing of ballots before certain defeat in November. Yes, such a move will cause the Hannity, Coulter and Nehlen faction to blow a gasket. But it is time to ask the Trumpbots a hard question: Just how bad do you want to beat Hillary Clinton? How sincere are you to restore constitutional, limited government? How much do you want a person of impeccable character to occupy the White House? Those who stood up against Joe McCarthy are revered today. Let’s do the honorable thing and — at the same time — the politically adroit thing: let’s give Mike Pence a running mate of whom we can all be proud. Let’s choose a real Republican to lead our party into November. EDITOR’S NOTE: I think Evan McMullin is prepared to step into that role as a real Republican. But that’s just me.